In stock -This product will ship today if ordered within the next 12 hours and 53 minutes. 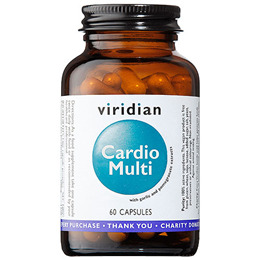 A specific formulation featuring a blend of supportive vitamins, minerals and phytonutrients to help promote cardiovascular health and function. Magnesium (as citrate and ascorbate), Vitamin C (as magnesium and calcium ascorbate), Pomegranate (Punica granatum) extract (40% Ellagic acid), Garlic (Allium sativum) extract (4.5% Allin), Vitamin B5 (as calcium d-pantothenate), Natural Beta Carotene/Carotenoid Mix (Dunaliella salina), Vitamin E Natural (d-alpha tocopherol succinate), Calcium (as ascorbate), Vitamin B1 (as thiamine HCI), Potassium (citrate), Vitamin B3 (as nicotinamide), Vitamin B2 (as riboflavin), Vitamin B6 (as pyridoxine HCI), Selenium (as methionine), Vitamin K2 (MK-7), Co-enzyme Q10, Zinc (as citrate), Choline (as bitartrate), Boron (as sodium borate), Iron (as bisglycinate), Inositol, Vitamin D3, Manganese (as citrate), Copper (as citrate), Chromium (as picolinate), Folic acid, Molybdenum, Iodine (from Kelp and potassium iodide), Biotin, Vitamin B12 (as adenosylcobalamin and methylcobalamin), Vegan Capsule. As a food supplement take two capsules daily with food or as recommended by your healthcare practitioner. Do not exceed stated dose. This is a food supplement. Not to be used as a substitute for a varied diet or lifestyle. Below are reviews of Viridian Cardio Multi - 60 Capsules by bodykind customers. If you have tried this product we'd love to hear what you think so please leave a review.